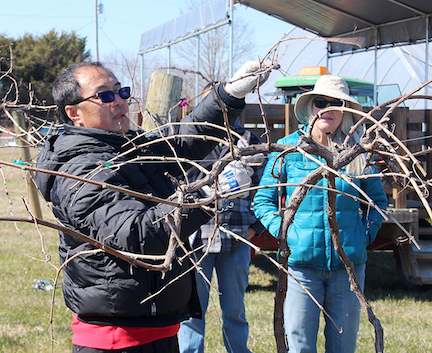 Lessons in proven pruning techniques to help maximize production and quality in your vineyards and fruit plantings will be taught as part of a special Pruning School workshop coming to The Ohio State University South Centers in March. OSU South Centers is hosting a Blueberry, Bramble and Wine Grape Pruning School workshop from 9:30 a.m. until 3:30 p.m. Thursday, March 14. This daytime educational opportunity will feature Dr. Gary Gao, Associate Professor and Extension Specialist at OSU South Centers; Research Assistant Ryan Slaughter; and Dr. Maria Smith, Research Associate with the Ohio State University Department of Horticulture Crop Science. • Field tour; and more. Morning activities will take place indoors, then following lunch, attendees will take a wagon ride for field pruning demonstrations on grapevines, blueberries and blackberries/elderberries. The workshop will be held rain or shine, although the agenda is subject to change depending on weather.